At Dow component JPMorgan Chase, CEO Jamie Dimon is the $20 million man. And he deserves every penny. JPMorgan Chase CEO Jamie Dimon at Davos. Source: World Economic Forum. The Dow Jones Industrial Average (DJINDICES:^DJI) was up 94 points in early afternoon trading Thursday as the markets await tomorrow's U.S. Labor Department jobs report for May. Perhaps no other industry is more closely tied to macroeconomic events than big banking. With exposure to individuals, small businesses, real estate, and giant corporations, megabanks such as JPMorgan Chase (NYSE:JPM) and Wells Fargo (NYSE:WFC) feel every hiccup in every corner of the economy. Managing these gigantic enterprises is no easy feat. And with oversized responsibility comes oversized paychecks. Wells Fargo CEO John Stumpf cashed in $19.3 million in 2013. JPMorgan CEO Jamie Dimon did even better, pulling in $20 million, a 74% raise from his 2012 pay. Wait, $20 million at JPMorgan? Aren't they in trouble, like, all the time? In 2008 and 2009, at least 14 lawsuits were filed against JPMorgan for violations of the Truth in Lending Act for practices in the company's credit card division. In November 2009, the bank settled with the SEC for $722 million for derivative sales that nearly bankrupted Jefferson County, Ala. In June 2010, the bank settled with the U.K.'s Financial Services Authority for $49 million for failing to keep protected client money in separate accounts. In January 2011, JPMorgan admitted overcharging on mortgages for several thousand active duty military personnel, and to illegally foreclosing on a small number. In July 2013, the bank agreed to pay $410 million in penalties for allegedly manipulating energy market prices. Several JPMorgan employees were also investigated for obstruction of justice in this investigation. The list goes on and on. There was the multibillion-dollar trading loss from the "London Whale." There is the over $2 billion paid related to the bank's failures dating to 1994 that enabled Bernie Madoff's Ponzi scheme. Does this list look like good management to you? Wells Fargo largely avoided controversy throughout the financial crisis while growing, profiting, and rewarding shareholders. It's easy to argue that based on these events and facts that Stumpf's pay is justified while Dimon's is a travesty. Stop for a moment and consider the truly mind-boggling size of JPMorgan. The bank employees over a quarter of a million people. It has nearly $2.5 trillion in total assets. Trillion. No human being could possibly monitor such a vast enterprise and prevent all possible mistakes or wrongdoing. You can argue that no bank should be allowed to grow so large in the first place, but that's a conversation outside the scope of this article. The reality is that JPMorgan is that big, and Dimon is tasked with managing it. Dimon's responsibility as CEO is prevent these crises as best possible, and when they occur his challenge is to uncover and correct them swiftly and in the least damaging way possible for the bank's businesses. His responsibility is to maximize the bank's results in terms of profits and returns to shareholders. His responsibility is to allocate the JP Morgan's capital to optimize future returns and at the same time protect the bank from unforeseen shocks. 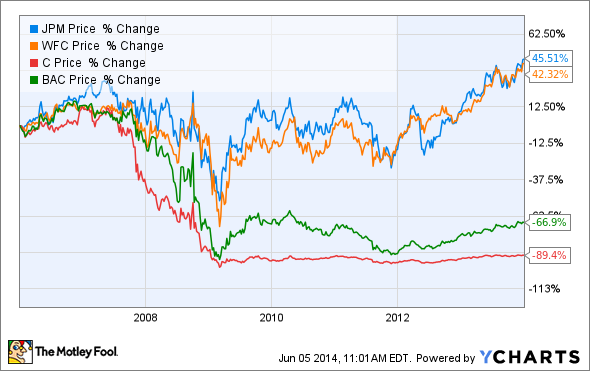 I've written previously that JPMorgan may be the single most undervalued bank in the entire industry. Why? Because the company is an extremely powerful earnings machine. It sits on an unparalleled balance sheet. Despite new regulations and higher capital requirements, the company has continued to deliver a return on equity above peer. Last year, Wells Fargo returned 37% to shareholders. JPMorgan brought home 36%. Excluding dividends and share buybacks, JPMorgan's stock appreciated 33% on the year to $220 billion. That's $55 billion of new wealth for shareholders. Just for context, Dimon's $20 million pay represents just 0.03% of that wealth creation. Looking only at 2013 is a short-term and potentially misguided view of Dimon's worth. Studying his entire tenure further justifies his leadership. From Dimon's first day as CEO on Dec. 31, 2005, through year-end 2013, the company's stock has performed just as well as Wells Fargo while crushing the other megabanks. Forget the mainstream media opining on the evening news. Ignore the politicians yelling from their soapboxes. Adjusting for nonrecurring charges and gains, JPMorgan earned $23 billion last year. That's $5.93 per share. That's 15% return on equity even with the headwinds of higher capital levels, new regulations, and all of the controversy listed above. Would JPMorgan be the powerhouse, shareholder-friendly profit machine that it is today without Dimon? I highly doubt it. For banks fortunate enough to promote elite leadership like John Stumpf or Jamie Dimon into the CEO role, it's worth it to compensate those individuals highly. Don't get lost in the sensationalism. Focus on what matters. That's what Stumpf and Dimon are doing, and that's why their respective banks are the best of the best.